The male zebra finch has some 2,000 genes in a region of the brain known as “Area X” that are significantly linked to singing and are also found in humans. The genes’ levels of expression change when the bird sings and UCLA scientists have developed a method to see what genes are changing together. They hope to use the similarities between the human brain and the songbird’s brain to gain a better understanding of speech-related disorders. Can the song of a small bird provide valuable insights into human stuttering and speech-related disorders and conditions, including autism and stroke? New research by UCLA life scientists and colleagues provides reason for optimism. The scientists discovered that some 2,000 genes in a region of the male zebra finch’s brain known as “Area X” are significantly linked to singing. More than 1,500 genes in this region, a critical part of the bird’s song circuitry, are being reported for the first time. Previously, a group of scientists including the UCLA team had identified some 400 genes in Area X. All the genes’ levels of expression change when the bird sings. “We did not know before that all of these genes are regulated by singing,” said Stephanie White, a UCLA associate professor of integrative biology and physiology and senior author of the new study. She believes the 2,000 genes — which are also shared by humans — are likely important for human speech. The research is published in the online edition of the journal Neuron, a leading neuroscience journal, and will appear in an upcoming print edition. Many more genes are involved in vocalization than scientists had previously known. While language is uniquely human, it has components — such as the ability to create new sounds — that songbirds and other animals share with us. The zebra finch may create new sounds using the same genes as humans, said White, who is also a member of UCLA’s Brain Research Institute. Male zebra finches learn to sing a courtship song between 35 days and 100 days after hatching, at which point they are sexually mature. Area X is located in the male finch’s basal ganglia, beneath the brain’s cortex. Only males have the full set of circuitry that allows them to mimic sounds. Female zebra finches don’t learn the courtship song and don’t have a brain region similar to Area X. Humans don’t have an Area X either. Two genes that seem to be especially important are FoxP2, a “master gene” that directs many other genes to turn on and off and which is critical for both human speech and birdsong, and reelin, a gene that is suspected of causing autism susceptibility in humans. Autistic children often have language difficulties. Both reelin and FoxP2 may play a critical role in human speech and speech disorders. A study published in 2001 revealed a single mutation in FoxP2 in each member of a family in England with a severe speech disorder. Over four generations, half the members of this family had the speech and language disorder, and each of these family members had the mutation. Those family members without the disorder didn’t have the mutation. Recent neuroscience research has provided insights into the connection between the brain and our behavior, including the ways in which our behavior can influence gene expression. “Everybody knows the brain controls our behavior, but in neuroscience, more recently, we have been learning that our behaviors also control our brain and change the way our brain operates,” White said. “If you’re a professional pianist, for example, you actually expand the territory in your brain that is devoted to playing the piano. When you practice the piano, a suite of genes gets turned on. When you practice hitting a tennis serve or a baseball, a suite of genes gets turned on. Our findings suggest different suites of genes get activated for different behaviors. 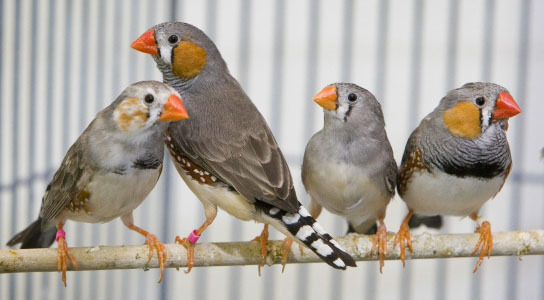 White’s laboratory showed in earlier research that when adult male zebra finches sing, there is a dramatic decrease in the amount of FoxP2 in Area X. In the current study, Julie Miller, a UCLA assistant researcher in integrative biology and physiology who conducts research in White’s laboratory, let 27 male zebra finches sing as much as they wanted (18 of them sang) for two hours in the morning — an activity that reduces FoxP2. She then removed Area X from the zebra finches’ basal ganglia. She also removed the tissue next to Area X, which is still part of the basal ganglia and contains the same genes but is not important for singing; this tissue is involved in movements such as flying and perching. Miller and Austin Hilliard, a graduate student in UCLA’s neuroscience interdepartmental program who also conduct research in White’s lab, then studied whether the same genes were changing in Area X and in the other tissue. Genes can be “on” or “off,” but there are degrees, like with a light dimmer, White noted. Overall, the scientists studied 20,000 genes in Area X (to determine which genes are involved in song) and outside of Area X (to learn which genes are involved in flying and perching). There are approximately 9,000 species of birds, approximately half of which are songbirds. Dolphins, elephants and some bat species also mimic vocalizations, White said. There are important similarities between the human brain and the songbird’s brain. In future research, White’s laboratory will study the role of reelin in the zebra finch and in mice. She and her colleagues will also continue to study FoxP2. She also plans to study hundreds of genes that move together. In addition to White, Miller and Hilliard, study co-authors included Elizabeth Fraley, a UCLA graduate student in UCLA’s molecular, cellular and integrative physiology interdepartmental program who conducts research in White’s laboratory, and Steve Horvath, UCLA professor of human genetics and biostatistics. The research was federally funded by the National Institutes of Health’s National Institute of Mental Health. Be the first to comment on "“Area X” of Zebra Finch May Provide Insights to Human Speech Disorders"